Tina's Crop Shop: Happy Birthday to Jaylei! Well I haven't posted in a while. Life just keeps happening and getting in the way of my crafting time! We have 4 granddaughter's birthdays in the Fall. I've already shared Nevaeh's Bunny card a few weeks ago and tonight I made a birthday card for her sister, Jaylei. Jaylei will be 6 in September! 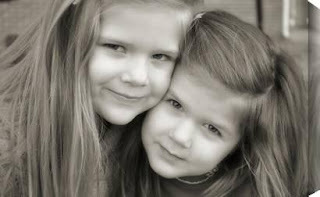 It's so hard to believe our sweet little granddaughters are getting so old! I went back and forth on what to use for the lollipop and I finally decided to just go with twine. I LOVE twine and really use it sooo much! Here's a close view of the lollipop..
Oh and here's a picture of Jaylei, our almost 6 year old granddaughter on her first day of school this year. She was really excited about her new backpack!.. Here's an older one of her with her sister, Nevaeh.. Here's what I used for today's card: Digital Stamp By Lori Designs "Pedal Pusher Lollipop Girl", Cardstock from Inventory, DP, For the Record by Bella Road "Tablecloth", Little Girl by Echo Park "Sally Stitches" Miss Caroline by MME "Dolled Up Living Blooms", Twine from Inventory, Ink Memento "Tuxedo Black", Sentiment Stamp "One of a Kind" by Stampin Up! Tina what a wonderful card you have made. 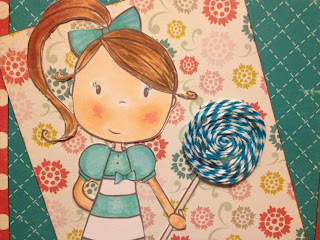 Love how you did the lollipop. Thanks for join us at ScrapbookStampSociety. Thanks Karin! I appreciate your stopping by! Thanks Nicole, you are too sweet! I think Jaylei will love it too! She is such a little doll! Beautiful card!Thank for joining us at ScrapbookStampSociety Challenge.Greetings Kaija DT-member .Hope to see again next week. Thank you Kaija! I appreciate your stopping by! Adorable! 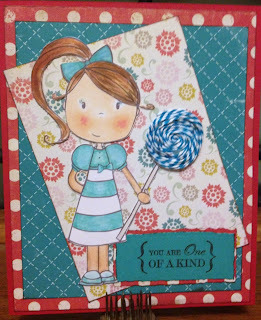 Thank you for playing along with By LORi Designs! The Hardest Card I've EVER made!